Automated machine learning picks an algorithm and hyperparameters for you and generates a model ready for deployment. There are several options that you can use to configure automated machine learning experiments. In this guide, learn how to define various configuration settings. To view examples of an automated machine learning experiments , see Tutorial: Train a classification model with automated machine learning or Train models with automated machine learning in the cloud. Before you begin your experiment, you should determine the kind of machine learning problem you are solving. Automated machine learning supports task types of classification, regression and forecasting. Automated machine learning supports the following algorithms during the automation and tuning process. As a user, there is no need for you to specify the algorithm. While DNN algorithms are available during training, automated ML does not build DNN models. If you are using a remote compute to run your experiment, the data fetch must be wrapped in a separate python script get_data(). This script is run on the remote compute where the automated machine learning experiment is run. get_data eliminates the need to fetch the data over the wire for each iteration. Without get_data, your experiment will fail when you run on remote compute. y Pandas Dataframe or Numpy Array label Label data to train with. For classification, should be an array of integers. To learn about the data prep sdk refer the How to prepare data for modeling article. Below is an example loading data using data prep sdk. # The data referenced here was pulled from `sklearn.datasets.load_digits()`. X = dprep.auto_read_file(simple_example_data_root + 'X.csv').skip(1)  # Remove the header row. # You can use `auto_read_file` which intelligently figures out delimiters and datatypes of a file. # Here we read a comma delimited file and convert all columns to integers. You can specify separate train and validation set either through get_data() or directly in the AutoMLConfig method. Use n_cross_validations setting to specify the number of cross validations. The training data set will be randomly split into n_cross_validations folds of equal size. During each cross validation round, one of the folds will be used for validation of the model trained on the remaining folds. This process repeats for n_cross_validations rounds until each fold is used once as validation set. The average scores across all n_cross_validations rounds will be reported, and the corresponding model will be retrained on the whole training data set. Use validation_size to specify the percentage of the training dataset that should be used for validation, and use n_cross_validations to specify the number of cross validations. During each cross validation round, a subset of size validation_size will be randomly selected for validation of the model trained on the remaining data. Finally, the average scores across all n_cross_validations rounds will be reported, and the corresponding model will be retrained on the whole training data set. Monte Carlo is not supported for time series forecasting. Use custom validation dataset if random split is not acceptable, usually time series data or imbalanced data. You can specify your own validation dataset. The model will be evaluated against the validation dataset specified instead of random dataset. Your local machine such as a local desktop or laptop – Generally when you have small dataset and you are still in the exploration stage. A remote machine in the cloud – Azure Machine Learning Managed Compute is a managed service that enables the ability to train machine learning models on clusters of Azure virtual machines. See the GitHub site for example notebooks with local and remote compute targets. There are several options that you can use to configure your automated machine learning experiment. These parameters are set by instantiating an AutoMLConfig object. See the AutoMLConfig class for a full list of parameters. Classification experiment using AUC weighted as the primary metric with a max time of 12,000 seconds per iteration, with the experiment to end after 50 iterations and 2 cross validation folds. Below is an example of a regression experiment set to end after 100 iterations, with each iteration lasting up to 600 seconds with 5 validation cross folds. The three different task parameter values determine the list of algorithms to apply. Use the whitelist or blacklist parameters to further modify iterations with the available algorithms to include or exclude. The list of supported models can be found on SupportedAlgorithms Class. The primary metric; as shown in the examples above determines the metric to be used during model training for optimization. The primary metric you can select is determined by the task type you choose. Below is a list of available metrics. Drop features with no useful information from training and validation sets. These include features with all values missing, same value across all rows or with extremely high cardinality (e.g., hashes, IDs or GUIDs). For numerical features, impute missing values with average of values in the column. For categorical features, impute missing values with most frequent value. For DateTime features: Year, Month, Day, Day of week, Day of year, Quarter, Week of the year, Hour, Minute, Second. For Text features: Term frequency based on word unigram, bi-grams, and tri-gram, Count vectorizer. Numeric features with very few unique values transformed into categorical features. Depending on cardinality of categorical features, perform label encoding or (hashing) one-hot encoding. Ensemble learning improves machine learning results and predictive performance by combing many models as opposed to using single models. When using automated machine learning, you can train ensemble models using the Caruana ensemble selection algorithm with sorted Ensemble initialization. The ensemble iteration appears as the last iteration of your run. For time series forecasting task type you have additional parameters to define. time_column_name - This is a required parameter which defines the name of the column in your training data containing date/time series. max_horizon - This defines the length of time you want to predict out based on the periodicity of the training data. For example if you have training data with daily time grains, you define how far out in days you want the model to train for. grain_column_names - This defines the name of columns which contain individual time series data in your training data. For example, if you are forecasting sales of a particular brand by store, you would define store and brand columns as your grain columns. See example of these settings being used below, notebook example is available here. # Setting Store and Brand as grains for training. Submit the experiment to run and generate a model. Pass the AutoMLConfig to the submit method to generate the model. Dependencies are first installed on a new machine. It may take up to 10 minutes before output is shown. Setting show_output to True results in output being shown on the console. There a few options you can define to complete your experiment. No Criteria - If you do not define any exit parameters the experiment will continue until no further progress is made on your primary metric. Number of iterations - You define the number of iterations for the experiment to run. You can optional add iteration_timeout_minutes to define a time limit in minutes per each iteration. Exit after a length of time - Using experiment_timeout_minutes in your settings you can define how long in minutes should an experiment continue in run. Exit after a score has been reached - Using experiment_exit_score you can choose to complete the experiement after a score based on your primary metric has been reached. You can view your results in a widget or inline if you are in a notebook. See Track and evaluate models for more details. The following metrics are saved in each iteration for a classification task. AUC_Macro AUC is the Area under the Receiver Operating Characteristic Curve. Macro is the arithmetic mean of the AUC for each class. Calculation average="macro"
AUC_Micro AUC is the Area under the Receiver Operating Characteristic Curve. Micro is computed globally by combining the true positives and false positives from each class Calculation average="micro"
AUC_Weighted AUC is the Area under the Receiver Operating Characteristic Curve. Weighted is the arithmetic mean of the score for each class, weighted by the number of true instances in each class Calculation average="weighted"
average_precision_score_macro Average precision summarizes a precision-recall curve as the weighted mean of precisions achieved at each threshold, with the increase in recall from the previous threshold used as the weight. Macro is the arithmetic mean of the average precision score of each class Calculation average="macro"
average_precision_score_micro Average precision summarizes a precision-recall curve as the weighted mean of precisions achieved at each threshold, with the increase in recall from the previous threshold used as the weight. Micro is computed globally by combing the true positives and false positives at each cutoff Calculation average="micro"
average_precision_score_weighted Average precision summarizes a precision-recall curve as the weighted mean of precisions achieved at each threshold, with the increase in recall from the previous threshold used as the weight. Weighted is the arithmetic mean of the average precision score for each class, weighted by the number of true instances in each class Calculation average="weighted"
balanced_accuracy Balanced accuracy is the arithmetic mean of recall for each class. Calculation average="macro"
f1_score_macro F1 score is the harmonic mean of precision and recall. Macro is the arithmetic mean of F1 score for each class Calculation average="macro"
f1_score_micro F1 score is the harmonic mean of precision and recall. Micro is computed globally by counting the total true positives, false negatives, and false positives Calculation average="micro"
f1_score_weighted F1 score is the harmonic mean of precision and recall. Weighted mean by class frequency of F1 score for each class Calculation average="weighted"
precision_score_macro Precision is the percent of elements labeled as a certain class that actually are in that class. Macro is the arithmetic mean of precision for each class Calculation average="macro"
precision_score_micro Precision is the percent of elements labeled as a certain class that actually are in that class. Micro is computed globally by counting the total true positives and false positives Calculation average="micro"
precision_score_weighted Precision is the percent of elements labeled as a certain class that actually are in that class. Weighted is the arithmetic mean of precision for each class, weighted by number of true instances in each class Calculation average="weighted"
recall_score_macro Recall is the percent of elements actually in a certain class that are correctly labeled. Macro is the arithmetic mean of recall for each class Calculation average="macro"
recall_score_micro Recall is the percent of elements actually in a certain class that are correctly labeled. Micro is computed globally by counting the total true positives, false negatives Calculation average="micro"
recall_score_weighted Recall is the percent of elements actually in a certain class that are correctly labeled. Weighted is the arithmetic mean of recall for each class, weighted by number of true instances in each class Calculation average="weighted"
The following metrics are saved in each iteration for a regression or forecasting task. While automated machine learning capabilities are generally available, the model explainability feature is still in public preview. Automated machine learning allows you to understand feature importance. During the training process, you can get global feature importance for the model. For classification scenarios, you can also get class-level feature importance. You must provide a validation dataset (X_valid) to get feature importance. 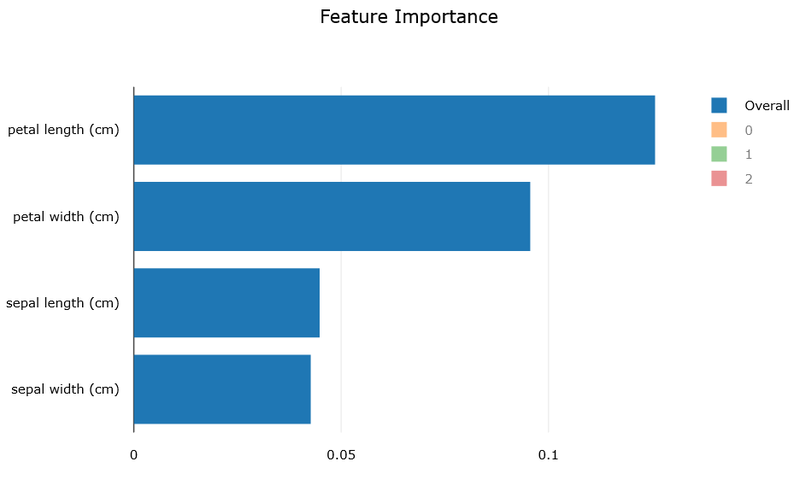 There are two ways to generate feature importance. Once an experiment is complete, you can use explain_model method on any iteration. To view feature importance for all iterations, set model_explainability flag to True in AutoMLConfig. Once done, you can use retrieve_model_explanation method to retrieve feature importance for a specific iteration. You can visualize the feature importance chart in your workspace in the Azure portal. The chart is also shown when using the Jupyter widget in a notebook. To learn more about the charts refer to the Sample Azure Machine Learning service notebooks article. Learn more about how and where to deploy a model. Learn more about how to train a regression model with Automated machine learning or how to train using Automated machine learning on a remote resource.